"God takes the first step, who has compassion, who has mercy and so often we, our attitude is indifference. Let us pray to the Lord to heal humanity, beginning with us: let my heart recover from this sickness which is the culture of indifference ". Vatican City (AsiaNews) - God "takes the first step" and loves "humanity that cannot love", but "the most ordinary opposite to God's love, to the compassion of God, is indifference"said Pope Francis at Mass celebrated this morning at Casa Santa Marta, offering the Eucharist for the eternal rest of Archbishop Giorgio Zur, former apostolic nuncio to Austria, "who lived in this House" and "who passed away yesterday at midnight ". 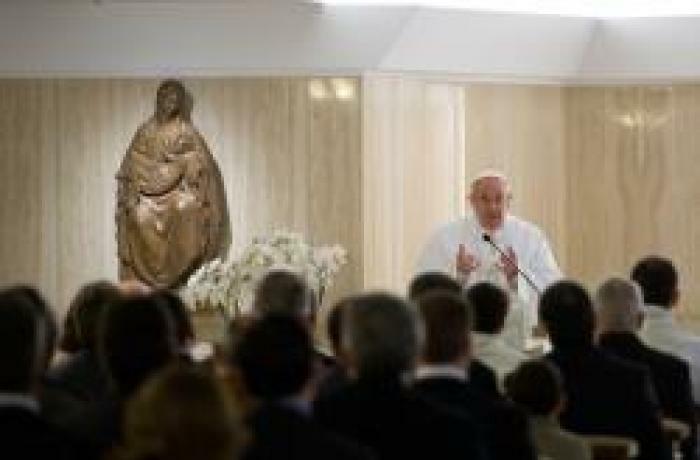 In his homily, Pope Francis reflected on the day’s Gospel (Mk 6:34-44) about the multiplication of the loaves and fishes, and on the First Reading, taken from the First Letter of John (4:7-10). The Holy Father said the Apostle John explains “how God manifests His love in us.” “Let us love one another, because love is of God,” John writes.